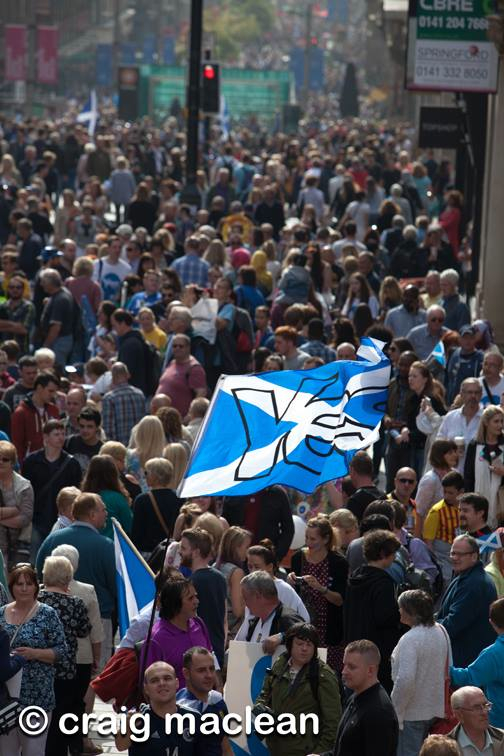 by Jonathon Shafi, Radical Independence Campaign Everyone remembers those exciting days and weeks on the lead up the referendum. For most of us this was the most exciting political period we had ever been part of. It was full of possibility and potential. This excitement expressed itself on the streets of cities, the town has of villages and in the Yes posters plastered all over our communities. The future was in our hands, and the movement of movements which was forging the way to a new Scotland was vibrant, inclusive and diverse. This surge in political action did not dissipate after the referendum. The huge shift in the political landscape is historic and complex. It reflects the deep and profound political awakening that has taken place thanks to the referendum process. Every pro-independence organisation reports the same: new interest, surging attendance at meetings and fundamentally a determination that we are not going back in our box. This is what happens when people feel they have a voice in the political debate. RIC has been an inspiring and testing experience for everyone involved. It is run by volunteers, and organised in local groups. It has been inspiring because it shows that even if you don’t have an established name, or any money, you can make a contribution that makes an impact. For the same reasons, it has been testing. For new campaigns, every moment in their development is a test that must be passed. If the first conference was a flop, it would not have got off the ground. If the second conference was not an improvement, there would have been speculation about its demise. If it did not transfer the energy of the meetings and conferences into mass action in communities, it would have been written off as a talking shop. All of this, and much more, has been an immense challenge. But the biggest challenge we face now is political. What direction should we take? How can we be most useful to the movement? What are our priorities? There are no easy answers for this. But we can be sure of some key features. We will remain as a broad movement of the radical left in Scotland. We will continue to engage on the social issues affecting ordinary people, and intensify our international relationships and outlook. We will remain an outward looking body of activism, inventing our own initiatives as well as supporting other people’s campaigns for social justice. People from all sorts of backgrounds are involved in RIC. Socialists, greens, trade unionists, students, CND activists, SNP members and so on. It is also developing international links with the likes of Syriza, Podemos, Quebec Solidaire and the CUP. Our commitment is to genuine social change and that has not dampened. The political awakening is here to stay and it is radical in outlook. RIC is only one part of this, and the start of our contribution post-No is this conference. We still believe that another Scotland is possible. From land reform to opposing austerity and privatisation, radical ideas are now firmly part of mainstream discourse in Scottish politics. Those ideas will help to improve peoples lives in the here and now, and they will be critical to winning independence in the long run. Despite the massive recruitment experienced by the SNP, there is now a huge opportunity for the radical left to consolidate its position built up through the referendum process as part of the mainstream in Scottish politics. There is an onus upon us all to make sure that the potential is met in dynamic, outward looking and inclusive ways. Imagine a Scotland where the radical left are the main opposition to a social democratic SNP. That would be a Scotland of real debate and genuine social progress. It could herald the start of a rebirth for the working class and socialist movement in Scotland, after decades of neoliberal attacks. By learning from each other, taking part in joint action opening a real discussion about our collective ambitions for socialism in Scotland can take us all forward. We will of course face challenges, but we will be stronger for facing them together. We are engaged in campaigning for a socialist future, because we know that we need system change to bring about an end to the deterioration of living standards, our environment and much more. At the same time, we need to urgently make progress in halting the austerity agenda and winning back basic rights. There is lots we can campaign for right now that can make a difference: let’s make it happen.